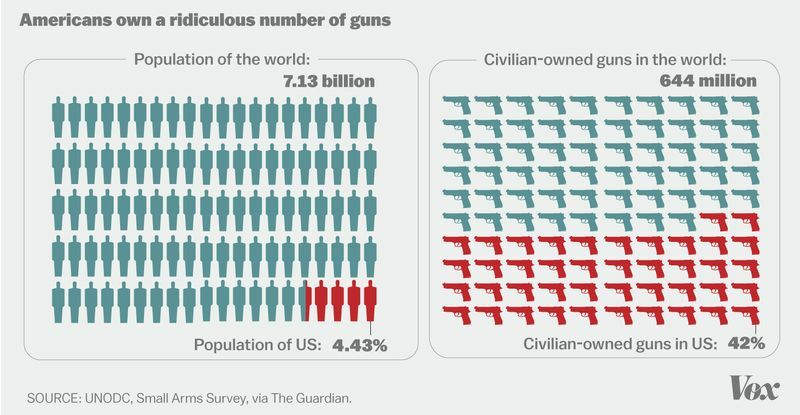 We’ve often heard that it’s the people and not the guns that kill other people. I think it’s more precise to say that most times it’s violent and aggressive people that kill other people and guns are the most efficient tool in accomplishing that. 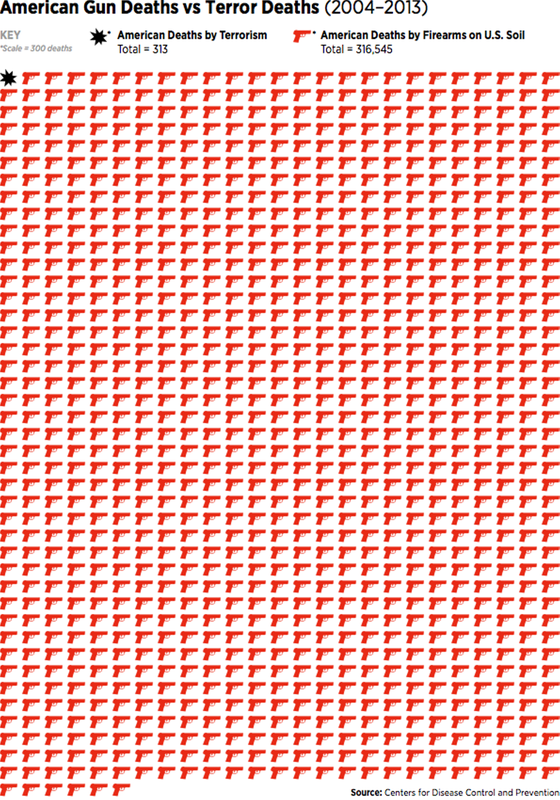 So, we need to carefully examine our attitudes and access toward guns. The fact is that Americans are far more violent than all other advanced Western nations and conservative U.S. states are generally worse than their counterparts. This is true whether the weapon is a gun, knife or something else. Firearms in the hands of violent people do tremendous damage. I think an intuitive analysis can give some insight as to why this is the case. When one is raised in and surrounded by a hyper-macho, weapon-glorifying and rapid-action oriented nation like ours, as has been a dominant American cultural trend and temperament since the Jamestown settlement in the 1600s, the result will often be harsh and brutal. Crime rates in all Western nations have been gradually declining for centuries, but America’s violence problem has been the worst among them for many decades. There are many admirable qualities about this country, but our excessive violence is obviously not one of them. It should not be surprising that in a society like this there is a prevalent tendency to attempt problem solving with aggression, gut feelings, macho posturing and swift reactions instead of restraint, patience, diplomacy and cooperation with legal measures such as gun control to prevent crime. Those extreme libertarians who want to nearly eliminate government oversight regarding gun purchases have yet to provide a comprehensive case that their viewpoint corresponds with the data – the more conservative and libertarian states very often have both higher rates of gun ownership and gun violence. 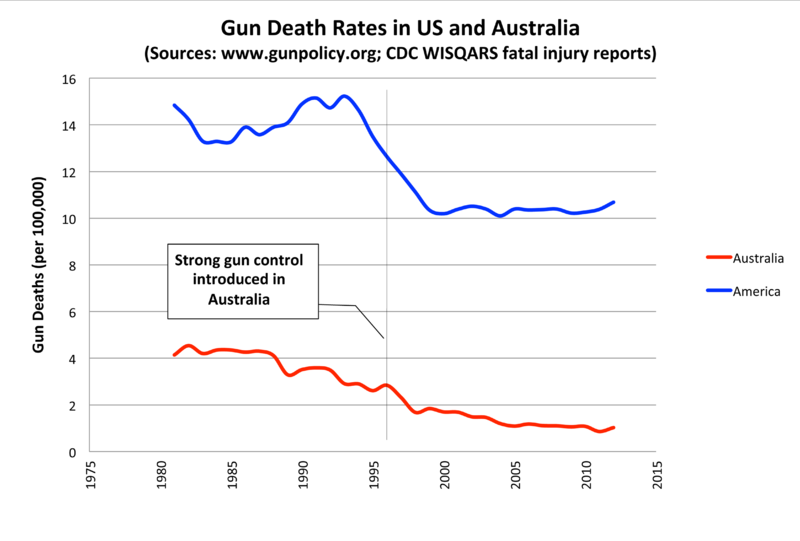 Australia, a nation with an often referenced example of firearm legislation success, added much stricter gun control laws in the 1990s. The gun violence rate went down considerably and has remained at this lower level ever since. They’ve not had a single mass shooting since 1996 – when a horrible event of this kind occurred and inspired their new conservative prime minister to lead actions toward passing new legislation just 12 days later. A Slate article points out that between 1995 and 2006 their “murder by firearm rate dropped 59 percent, with no corresponding increase in non-firearm-related homicides. The drop in suicides by gun was even steeper: 65 percent. Studies found a close correlation between the sharp declines and the gun buybacks. Robberies involving a firearm also dropped significantly. Meanwhile, home invasions did not increase, contrary to fears that firearm ownership is needed to deter such crimes. But here’s the most stunning statistic. 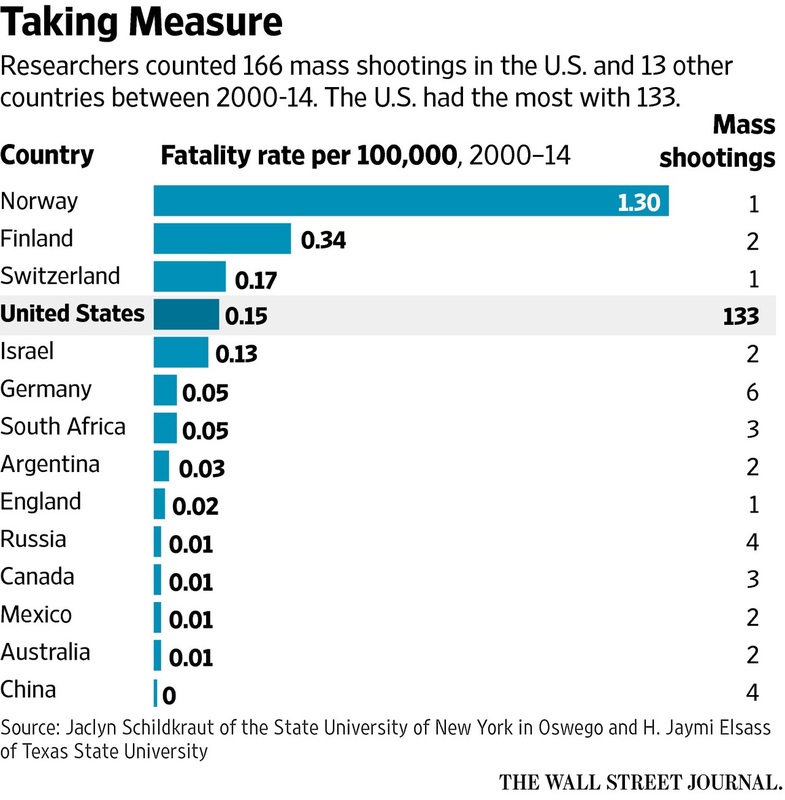 In the decade before the Port Arthur massacre [in 1996], there had been 11 mass shootings in the country. There hasn’t been a single one in Australia since.” Mother Jones used official government statistics to thoroughly study mass shootings in America between 1982-2012. Among their findings was the fact that 49 of the 62 events involved weapons obtained illegally. America’s level of violence and unwillingness to address part of this dilemma with more effective gun legislation is embarrassing, barbaric, absurd and tragic. 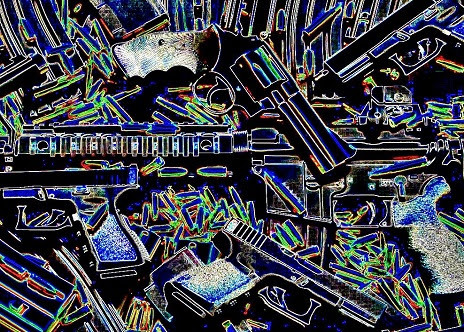 We certainly need to recognize personal responsibility in the shooters and possible mental health concerns, but a thoroughly honest look at regulations is also very necessary. As of November 30th, 2015, 351 mass shootings in which 4 or more people, including the shooter(s), were killed had occurred in just 334 days. This is worse than 2014 and 2013. In just the last week of November 2015, mass shootings like this happened 12 times. Australians can still buy guns. But, the correlation between a radical decrease in their gun violence levels for two decades after tighter laws were enacted should be seriously considered. We need help in improving this terrible American situation. Our hands-off approach has been failing not just for decades, but generations. In contradiction to constant refrains on the far right, mass shootings have been studied thoroughly and been found to have very little to do with whether a city or county has a ban on particular kinds of firearms that potential victims could use for self-defense. Instead, what the data shows is that most of these shooters, usually on impulse and actions not planned in reference to strict gun law areas, go to places of work, family activity or areas where they can gain access to crowds to make a grand violent expression of their narcissistic frustrations. They often are motivated by revenge and/or fame. Of course, many times they have mental disorders – another reason why thorough background checks are so important. “‘Especially some of the younger ones — they want attention,’ said Mary Muscari, a forensic nurse at Binghamton University in New York who has studied revenge-driven mass killers. ‘That’s why you see them wanting to have a bigger head count, a bigger body count, to try to outdo the last one or to do something that is going to cause more of a rise….Meanwhile, a just-released study finds that although the United States has just about 5 percent of the world’s population, the country has 31 percent of the world’s mass shooters. The reasons for these numbers are complex, researchers say, but the data suggest that the availability of guns, and perhaps the American obsession with fame, may be to blame…. “The United States has more private gun ownership and more desire for fame than any other country in the world, said Adam Lankford, a criminal justice professor at the University of Alabama and author of the new research, presented…at the annual meeting of the American Sociological Association….What did predict the number of mass shootings, however, was the prevalence of firearm ownership, Lankford found. 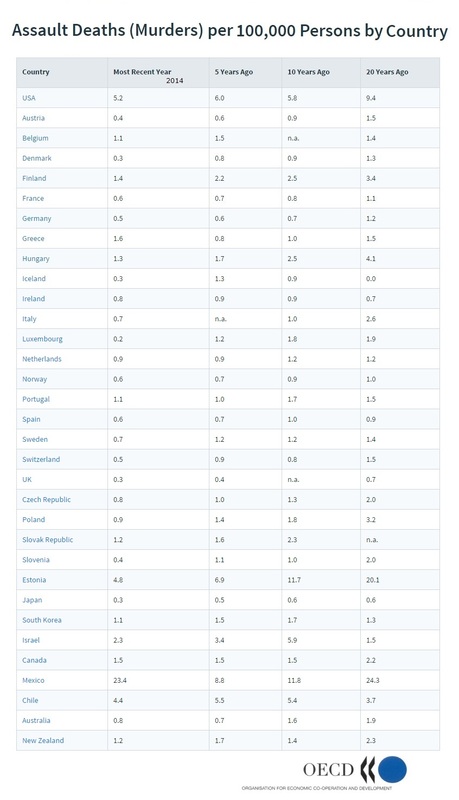 Countries with higher firearm ownership rates had more public mass shootings….’That wasn’t a shocking finding, but I guess what surprised me was it showed up no matter how many or what type of statistical tests I ran,’ Lankford said. ‘It was kind of unshakable.’…The link between firearm ownership and mass shootings remained even when the United States was removed from the analysis, Lankford said. 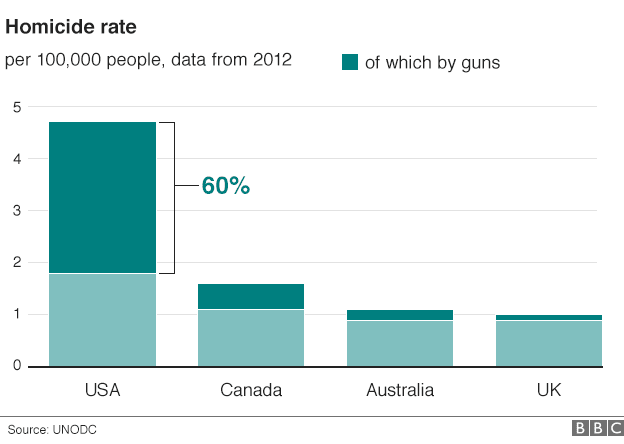 For example, Switzerland and Finland, two relatively low-crime countries with high rates of personal gun ownership, had more mass shootings than would otherwise be expected….Studies within the United States have also found links between gun ownership and gun crime. 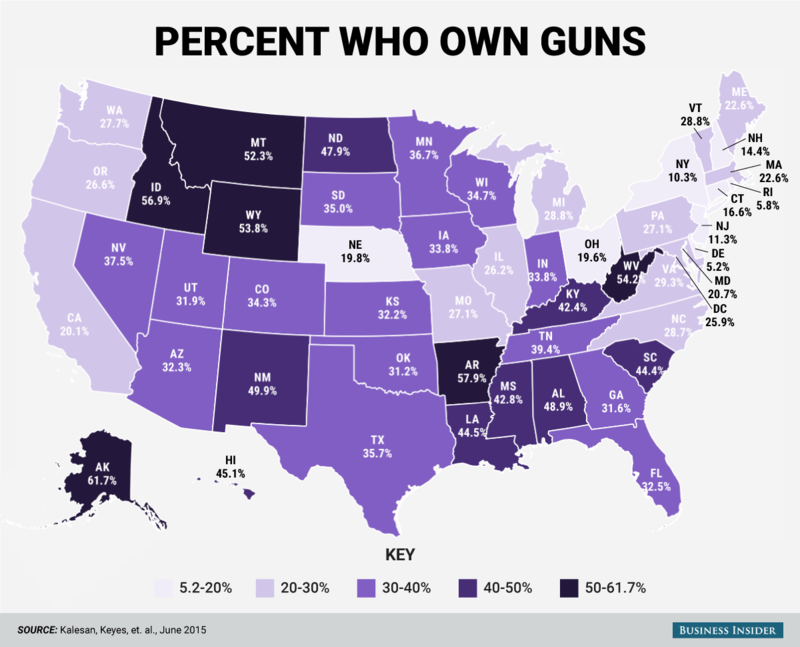 Research published in July found that states with more gun-owning households had higher rates of firearm assault, robbery, homicide and overall homicide compared with states with fewer gun owners…. An analogy can be made from our excessive tendency toward violence upon each other to how militaristic we are internationally. 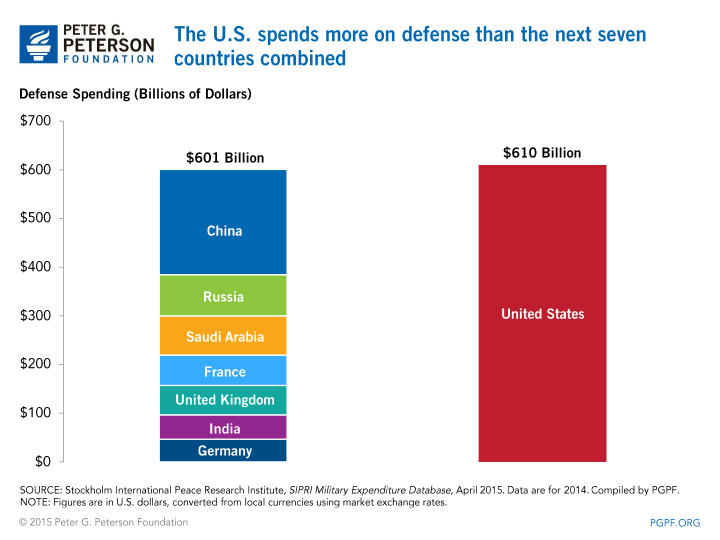 Between 2007-2016, for example, the defense budget has ranged between being larger than the next 7 to 13 high spending nations. 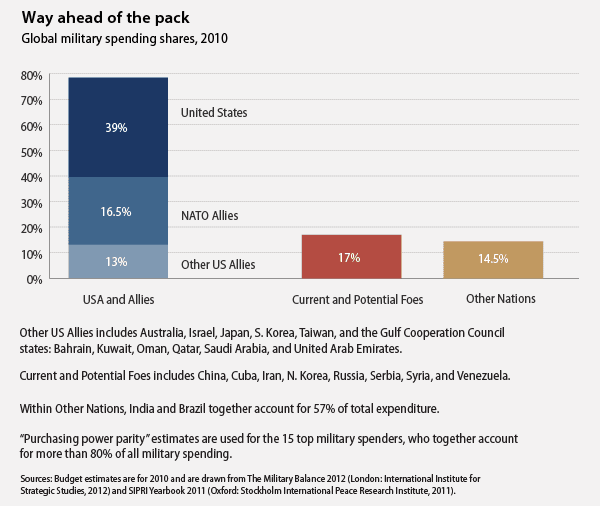 The money dedicated to this purpose in 2010 represented 39% of all spending on armed forces around the world. 16.5% belonged to our NATO allies, 13% to other allies and just 17% to nations considered to be current or potential enemies. Though on the positive side many times acting as a savior to the defenseless, the United States is also famous for aggressive and often unilateral warfare – for decades in the recent past and really back to our national origins. Our nation has been at war in nearly every decade since 1776. Whether it was land grabbing from and sometimes extermination of the Native Americans or straightforward military conquest of much Mexican territory, we’ve engaged many of our problems and desires with rough force and bullying. As someone who served 5 years in the Army Reserve and recognizes serious threats to our national security, I am very much in favor of maintaining overwhelming strength over our possible enemies. However, there is a point where a society can go too far in this direction. The rugged or swaggering image of the pioneers on the prairie or cowboys of the Wild West remains largely hallowed in our society. Some of this is worth celebrating when we discuss the bravery and self discipline which many of them possessed. The not so impressive character trait common with those figures was their knee-jerk instinct to fight regarding another person or people group standing in the way of what they wanted or thought was righteous. There are other ways to get what one wants or thinks is right than choosing to battle, though sometimes that is the only option. Thankfully, for many generations no American city or state has had a murder rate even close to that of the Wild West in the late 1800s. Back then, some towns experienced a murder rate of over 30%. Compare that to the 3% violent death rate in Europe and the United States combined for the first half of the 20th century, including WWI, WWII and civilian situations. Much of the areas in America with high murder rates today were formerly known as pioneer territories. This can lead one to ask if certain sections or particular types of regions of this country are becoming civilized at a slower pace. Over the past few years, I’ve discovered the same trends in other types of social ills and gathered many academic and government charts and articles that provide the relevant data. Among Western nations and individual states within the U.S., those which are the most conservative and religious are the most violent and plagued with far greater social problems in categories like overall crime, infant mortality, environmental abuse, teen pregnancy, incarceration, economic mobility, life expectancy, poor educational systems, murder, healthcare efficiency, average worker to CEO pay ratio, paid maternity leave, obesity, income inequality and minimal worker’s benefits. For example, on the Quality of Life Index for 2010, the United States – the most religious and conservative country in the developed world – ranked 33rd overall, 39th in health, 24th in education, 17th in wealth, 15th in democracy, 77th in peace, 38th in environment. That information above is not meant to be shared as an attack on all conservative people or their beliefs, but it’s a critique directed toward the extreme conservatism and far-right religiosity common in America today, especially in stark contrast to 40 or 50 years ago and in other developed countries today – which were and are generally healthier and more successful in providing an overall high quality of life. Among the violent threats involving guns, we also must face the danger of militant Islamic terrorism, especially because much of the attacks since 9/11 have been through radicalizing American Muslims. 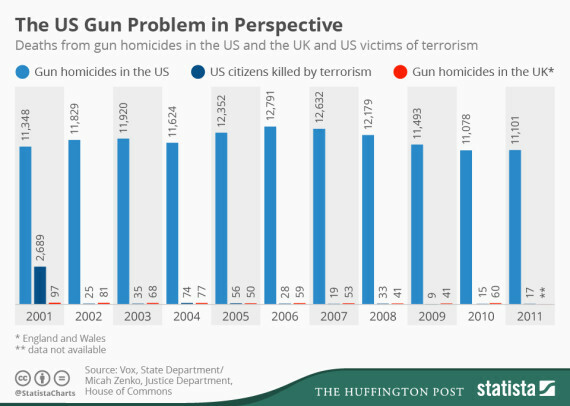 All of it must be kept in the context of possible gun legislation, among other strategies, because those terrorists had to first gain access to the unusually high round firearms that many of them used. Really, any mass shooter could be accurately called a terrorist, whether Muslim, Christian, secular, foreign or native. The technical definition of terrorism relates to political action, but in a general and realistic sense, an act of mass killing is equally horrifying for the victims, families and communities no matter what the particular motivations of the assailants. Out of the hundreds of mass murders and thousands of related deaths since 2002, Muslim extremists were the cause of a very small portion – a half dozen such events with less than a hundred killed. Of course, we must fight against radical Islamic terrorists and very carefully vet immigrants and refugees, but what will we do to seriously deal with the biggest sources of violence in our society? 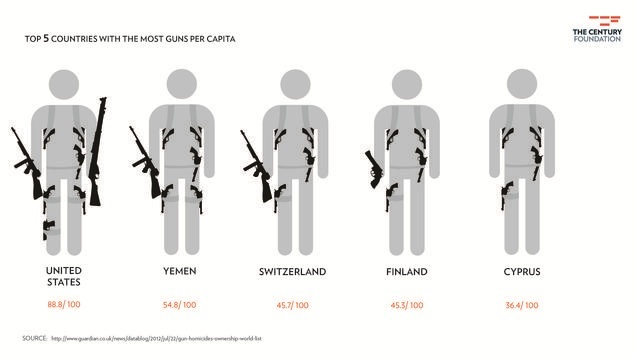 We are the most violent country many times over among well developed Western nations. During the 9/11 attacks, we lost nearly 3,000 people and rightly sought to lash back at the culprits. 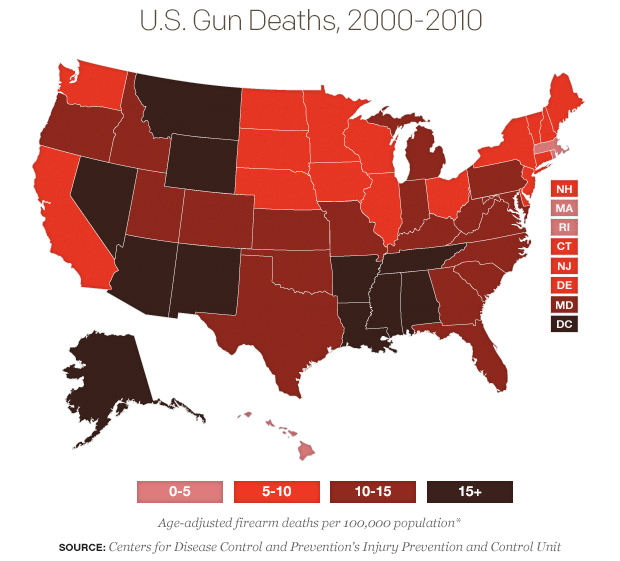 But when the amount of Americans slaughtered by internally caused mass death incidents hovers around 2,000 year by year, many people in our country refuse to engage the facts that plainly reveal the desperate and urgent need for much better gun laws (along with continued efforts in law enforcement and mental health care). The number of murders in this country during 2014 and 2015 (about 28,000 total) is close to the amount that researchers have concluded were killed by ISIS in the lawless environment of western Iraq during that time frame. Obviously, the American population is much larger, at 318 million compared to around 30,000 in ISIS. The point here is that our brutal patterns of behavior are causing much more damage to us than any terrorist attacks. Since 9/11, a profoundly feared large scale death toll brought upon the United States by al Qaeda or other militant Islamic groups has not happened. This is at least because of intense and specific intelligence gathering and vigilant police work. It’s not because the hysteria expressed by many Americans, who wanted greatly exaggerated measures to be taken (just like they do today with refugees and immigrants), was actually grounded in sound anti-terrorist methodology or accurate statistics. The policies and approaches that we use to prevent violence, no matter what the political or apolitical motivation of the criminals that we’re opposing, need to be based on solid research and time-tested methods, not paranoia or misguided quasi-patriotism. As for the specifics of gun laws, I think that assault weapons and high-capacity magazines should be banned except possibly at shooting ranges and all other firearms should be thoroughly regulated. Something like this ought to be common sense and common practice. Next Can Business Save The Environment? First off, I truly appreciate the time, effort and research you put into this article. As a conservative gun owner, the majority of articles I read are slaps in the face, due to lack of research and a high amount of ignorance. I see neither here, so thank you. Now, I can wholly agree that we need more background checks, especially at gun shows, and other venues of where it’s much easier to purchase firearms, ammunition and the like in bulk. No one blinks an eye at it, and it’s encouraged for the most part. The firearm industry has made millions that way. I’m an ex-conservative and have a sympathetic mindset toward my fellow citizens who look at the world in that way (including almost my entire family). I consider myself to be a moderate now. I’d love to hear what you think of my other articles, if interested. I do put in an enormous amount of time into research and editing, hoping to offer solid content that people can engage with. I will most definitely take a look. Pinky promise, :-D. I’m conservative on most issues, but there are some I lean left on. I am most definitely interested, and will take a look at what else you have written. They’re long reads, but if they’re anything like this, it’s well worth the time spent. Some of them aren’t as long. For instance, the last 7 articles that I wrote on Donald Trump are much shorter than normal posts. I’m excited because the one titled, “15 Key Foundations Of The Trump Campaign That Are Radically False”, will be professionally published tomorrow on pastemagazine.com/politics. It’s my first paid article. 🙂 I’m trying to write on politics as a career. I saw your post about how you voted for Trump. I’d be interested to hear what you think of what I’ve found out through lots of research and written about him. Check out my first ever paid and published article!